Feel the Invigoration and energy of vibrant health running through veins once again? Get “cart horse” like stamina in your daily routine ? Have Clear Glowing Skin that people can’t help but notice? Kiss goodbye to Gas or Bloating and poor digestion forever? Reinforce Your Immune System – No More Colds and Infections? Banish Joint or Muscle Pain from your life for good? Experience razor sharp Mental Alertness? Sleep like a baby and Wake Refreshed every morning? Stop Craving Unhealthy Foods that make you fat? It’s Not! Why Did I Dedicate My Life to Detox? This is the reality for hundreds of the people I see every yearas a nutritionist. I feel so much better after these detoxes that I plan to do them on a regular basis. "I can't believe detoxing can work so quickly"
I started on the least restrictive diet and within 2 weeks my craving for sugar had gone, I was back in the gym and started to feel my old self again. I can't believe that detoxing can work so quickly and now that I feel so good again I'm watching what I eat very carefully. Thanks again. My name is Sandy Halliday, Nutritionist, health expert and former nurse. Every year I was seeing hundreds of people who are suffering with all sorts of health issues whose lives are completely transformed by my detox diet secrets. I love seeing their health issues and lives turnaround so much that I’ve decided to go one step further than just seeing people one to one. I want to make this life changing information available to as many people as possible- but for a limited time only. More on that in a second though. If you are suffering with ill health right now I want you to know that I know exactly how you feel and I know what you’re going through. The good news is that my Detox secrets may well hold the key for you to unlock the door to more energy and vibrant health than you ever thought possible. 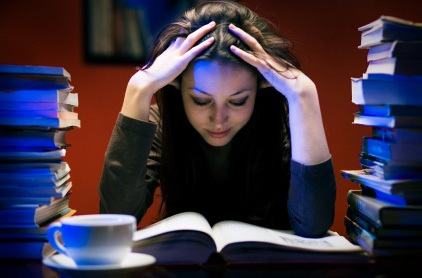 For many years I suffered with chronic fatigue that nothing seemed to help. Every day was like dragging a ball and chain around and even the smallest task seemed like a massive chore. My doctor suggested several differentregimes and prescriptions at the time but nothing seemed to help. I was getting quite desperate one day when a friend told me about something called the“master cleanse” diet that had helped her with chronic fatigue. My pursuit of information about the Master Cleanse was leading me from one source to another and all the information pointed in different directions. The one common method was starvation and fruit-only diets which I did not feel were for me. There was also a ton of conflicting information out there which I was finding difficult to wade through. One thing kept me going throughout this time though... I wanted to feel better again. 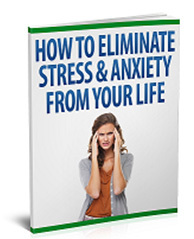 AndI just knew from all my research that the root cause of all my problems was due to my body becoming overburdened with toxins, all I had to do was to find a process that effectively eliminated these toxins, PERMANENTLY! I had realized just how important detoxing really is to restore health. Your body is like a high efficiency filter. It takes in water, food and other elements and distributes them evenly throughout the body. But like any filter, it becomes clogged with bad elements. As more and more bad elements are allowed to pass through the filter, they build up on the surface of the filter and create a sludge-like substance. After a while, the filter stops working properly. If your body doesn’t have the proper cleaning system to get rid of the sludge, it starts to become choked up like blocked drain, overflows with waste and becomes a colony for bacterial infections. If you experience symptoms such as bad breath, aging, skin disorders, weight problems, constipation, gas, bloating, aches and pains on a regular basis, it might be a sign that your body needs to clean out its filter. Consider how processed our foods are and how we don’t eat the naturally cleansing substances of older generations. We’ve taken great strides to make sure that foods are tasty and easy to consume, but by over-processing the fruits, vegetables and roughage we’re just allowing our bodies to build up sludge. Toxic chemicals come from the foods you eat, water you drink, air that you breathe, things that you put on your skin and the products you use for cleaning your home. These foreign chemicals have overwhelmed your detox system. They clog up your body affecting your cells and joints. On The More Important Things In Life! Your health success is determined by the quality of the information you get, theexpertise of your source and how you choose to implement that information. You need the help of someone whose been involved in health, nutrition and food preparation for many years and attended seminars given by top raw, living food experts, naturopaths and other professionals who recommend detox in their practices. All of the best info had been compiled into my comprehensive detox diet. Understanding the health benefits of detox is an ongoing learning opportunity. You are introduced to new chemicals and toxins all the time, so why wouldn’t you need toadjust our detox programs to stay ahead of the damage? With food recalls, contaminated food containers, and everything else you’re dealing with on a daily basis, don’t you owe it to yourself to have the best knowledge we can get your hands on? Why Is Proper Detox So Important? If your body doesn’t have the proper cleaning system to get rid of the sludge, it starts to become choked up, overflows with waste and becomes a colony for bacterial infections. If you experience symptoms such as bad breath, aging, skin disorders,weight problems, constipation, gas, bloating, aches and pains on a regular basis, it might be a sign that your body needs to clean out its filter. Many Natural Medicine and Herbal practitioners believe that growing numbers of people suffer from the wide range of chronic symptoms and diseases from underlying toxicity more now, then at any other time in history. Even if you suffer from tiredness, headaches, constipation, frequent colds, flu andother infections, and even the inability to lose weight you could benefit from a detox. Through trial and error, I found the schedule, process and foods that have worked the best and created a program that I could adjust depending on how intense a cleanse I wanted. It wasn’t long before my health returned and people started to take notice of the changes in me. Initially it was family and friends that asked me what I was doing that had me full of energy and looking so well and if I could share my secrets of detoxing with them. After I had success with improving their health and vitality with my specialist detox program it wasn’t long before other people started to approach me with their health problems. People came to see me because they were not getting better with the approach they were taking, usually recommended by the doctor, or else the doctor could not find anything really wrong with them using the standard blood tests. They were searching for solutions to their health problems that the doctor could not give them. What I discovered from dealing with all these people is that most people wanted all the information in one easy-to-follow format based on their own hectic schedules. They couldn’t commit to the intense programs that other cleansing programs sell. Other programs take a lot of time and energy. Though the results "could" be good, they just didn’t want to finish the program. In response to all of this I came up with a specialist detox program where people can choose how deep and how intense they want to detox according to the time they have and how experienced they are. Other diet plans are less effective, restrict you to starving yourself or eating foods you hate, drain your energy, and charge upwards of $60 per month. My detox diet on the other hand, will allow you to eat great tasting food, increase your energy level, and allow you to live a healthier more fulfilling life. You get to choose how much effort you want to put in and how deep you want to go with the process. I also go into more detail than other people out there about how to maximize the benefits of your detox experience. Everything I’ve learned about detoxing over the years that has vastly improved my health and other people’s health and vitality is now available in an instantly downloadable guide in PDF format that you can be viewing in just minutes from now. A personalized detox questionnaire for you to assess where your health is right now and what your detox goals should be. When the best time is to detox-discover how the seasons play a vital role is determining the best time to detox. 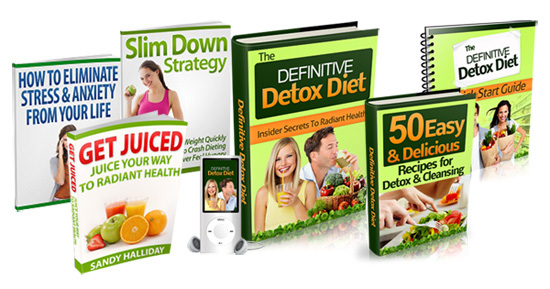 All the elements of a successful detox program. I leave nothing out here. Identify all the harmful substances in your life that are draining your health and energy away. Get your body to flush out all the waste products that it contains so you can feel full of life and energy once again. Cleanse your internal organs so they work like new and maintain their vitality. Discover the right kind of nutrition that you need to support your journey back to full health. Protect yourself from exposure to everyday chemicals that destroy your health. Why modern research says that water fasting is dangerous. The real problem with wheat and dairy that hardly anyone ever talks about. The truth about PH balance and how adjusting it the right way can make a massive difference to your health. How to balance your glandular health and improve your overall health. The importance of adrenal function to overall health. The most important gland you need to target in order to have a successful detox. The most harmful hormone in your environment right now. this book. Both were easy and effective, and the instructions were complete and easy to follow. I feel so much better after these detoxes that I plan to do them on a regular basis. How you can cleanse effectively without resorting to nothing but fruit and vegetables and a nasty “healthy drink” every day. How your family won’t know the difference when you are serving them up delicious detoxing healthy dishes. Exactly what you need to do after each body cleanse for maximum effectiveness. Improve the natural detox power of your body for more energy and health in your life. Why many other detox diets fail to achieve proper detoxification and can actually leave you feeling more stressed, anxious and lethargic. I first heard about The Definitive Detox Diet - Insider Secrets to Radiant Health through one of my Personal Trainers at my Health Club, I have always felt that detoxing is like servicing your car after 10,000 miles. All the hoses and filters are washed, the interior is polished, and every nook and cranny is thoroughly cleaned! I know from previous experience that most of the population does not receive the recommended amounts of fresh fruits and vegetables each day. Nutrients from these foods are critical in providing antioxidants and supporting many key body functions and that included me! I started using the detox plan about 2 months ago, after about 9 days I was full of energy and vigour. I began working out regularly and started running again. I have completely regained my ability for strength and stamina and have a deep desire to train and begin racing again. My nutrition is now complete and I cleanse regularly for health and maintenance. I now recommend this book to all of my clients and friends, this book has been my fuel for life!
" I feel better than I ever remember"
Just by following the Level 1 Detox Diet, gradually getting rid of bad foods in my diet and increasing my vegetable and fruit intake, I feel better than I ever remember. "Detox No Longer A Drag!" " What a great find! I have used lots of these recipes and have been pleasantly surprised that they are really delicious; it's so much easier to be healthy when you can find quick, easy and truly tasty recipes - thanks, this is wonderful and highly recommended. Detox is no longer a drag!" 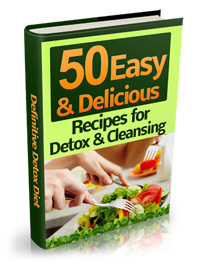 Thank you for writing such a brilliant book on Detox, I have really benefited from it. Before I went on the diet I had been locked into a vicious circle of comfort eating,mainly sweet things and had become very depressed. I had obviously put on weight, had no energy, no motivation, and generally felt low. 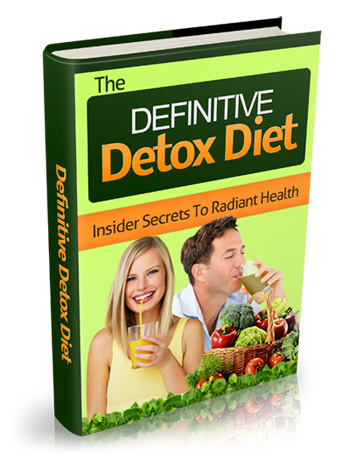 People who try the Definitive Detox Diet report skyrocketing energy levels and overall improvements in their health after they have been on their first cleanse. One cleanse can remove years of accumulated sludge in your system and can have you running on top form again like a high performance engine after an oil change. My detox diet plan is not crammed full of foods that are “good for you” but taste like how you’d imagine cold seaweed would. You can have many of the foods that you love on this program and you can replace the ones you are missing with alternatives that you’re going to love. You can also go as deep into your cleanse as you like and be as extreme as you want depending on your goals, experience etc. One of main benefits that many of my clients experience on this plan is simply enjoying life more. Life is for living to the full and when you are feeling great on the inside, things us seem to go better on the outside too. How much is the Definitive Detox Diet worth? It’s hard to put a price a good health, energy and vitality but it not unusual for people I have met to have spent thousands of dollars on different treatments before they try the Definitive Detox Diet. Some of them have even lost jobs or have had many sick days through ill health and lack of energy. It’s easy to see how something that restores good health and energy in your life could be valued at hundreds of dollars at the very least. You don’t have to spend anything like that today though. That’s a fraction of the cost you would spend on different therapies or lost working days and medical bills. If you return to this page later on, the chances are that I will have increased the price to a more realistic level. And That’s NOT All - My Fast Action Bonuses! My Recipe eBook contains over 70 tasty and easy-to-prepare recipes that nourish and strengthen the body. You have the choice of both raw and cooked creative recipes that all the family will enjoy. that I could not stop at just 50! Tasty but simple grain dishes. I want to make the detox easy for you so I've put together this Quick Start Guide so you can dive straight into your detox. 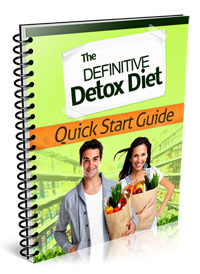 - Planning and preparation are the keys to making the detox really simple. 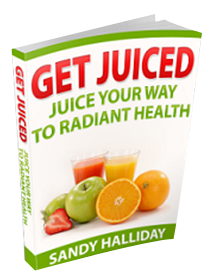 Get the maximum benefits of fruit and vegetables with juicing. - Juicing for Stress Relief. Life today can be overwhelming – there’s no denying that! 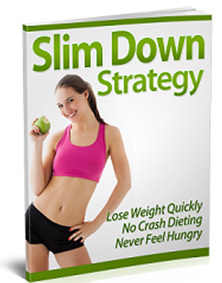 "Discover how to lose weight and never feel hungry." Download it & All the Bonuses Now! Now including MP3 audio version for easy listening. All Payments Are Handled By Clickbank, the internet's most secure retailer of digital products. Don’t say "NO" to your health any longer! 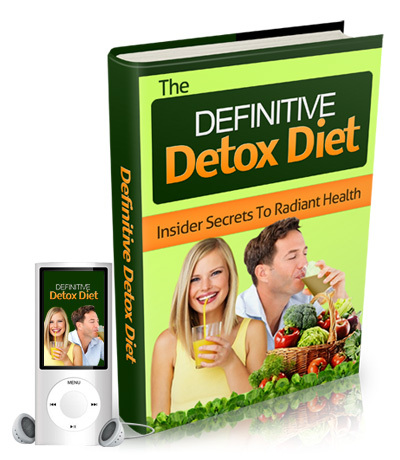 Try my customized Complete Body Detox The Definitive Detox Diet – Insider Secrets to Radiant Health at my risk for 60 days. If following my program doesn’t help you to look and feel healthier, I want you to send it back so I can give you a complete, no-questions-asked refund! P.S. In one weeks time you could running around with the energy of a ten year old after you try my Definitive Detox Diet. P.P.S. Think how much better areas of your life will be when you have more energy and you feel great. P.P.S. Still here? No problem- check out what Jason Turner had to say about my program.